Planning a SwimRun race seemed to be a little tricky. Choices are generally a long-distance event in the UK, or a far-off land requiring a lot of training, or distances that (in my opinion) seem too small to actually take the effort to travel to the end of the country to get to. So, on finding an event in North Wales (Holy island) which was 18K total distance seemed a great event to kick start my SwimRun experience. Watching the video trailer for the event sucked me straight in and after some persuasion formed a team mate and another team to compete against. This was going to be brilliant! Predicting the weather for a late September race, in North Wales after storms battered the UK we thought it would be wet and windy but we totally lucked out with sunshine and clear skies. Race registration was short and sweet the evening before and we were all set to race on the Saturday morning. We had a girls vs boys approach with our teams and the female teams set off 5 mins before the boys so the pressure was on to keep ahead! 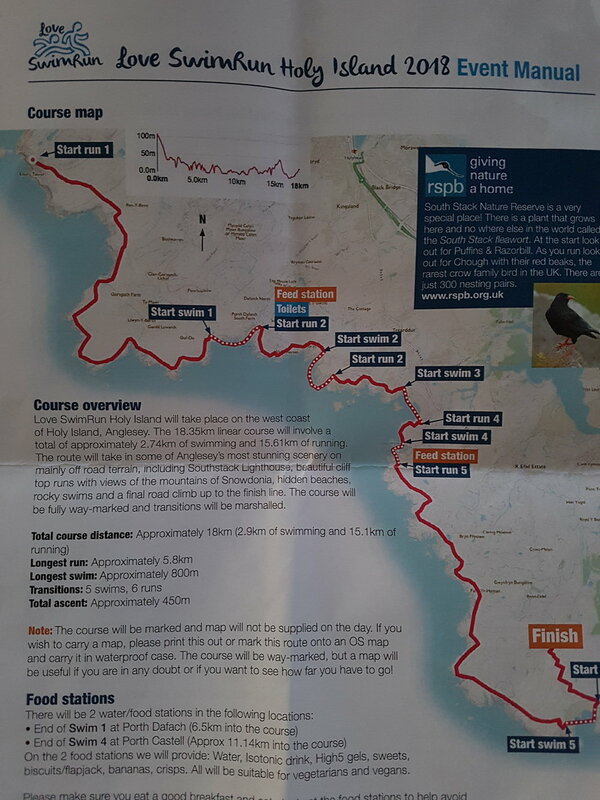 The event itself is a 18k total distance running and swimming along the North West to South coastline of Holy Island. The course consists of 5 swims and 6 runs and the ratio work well. The majority of the runs are along trails hugging the coastline, and you dip in and out of the sea, swimming various bays along the way. Kit choice is interesting for this type of event. There is some mandatory kit, and the event organisers may be applauded for making one of these items a reusable cup to avoid any single use plastics along the course and proving water only and no plastic water bottles. Otherwise the wetsuit of choice for me was a zone3 swim-run wetsuit. Which is essentially a shortie with detachable arms, zip at the front and a pocket/pouch at the back. It was really comfortable to race in and I'd recommend it. Shoes are the nest biggest choice. I trialled swimming in my usually Asics trainers but failed so used a pair of trail trainers that are usually for cross country events but did me a great service on the day. Then you can carry a pull buoy and or hand paddles. I chose not to have either but most competitors had a pull buoy strapped to their thigh (got to still carry it thought the runs!). I have to say I didn't feel as though I needed it. And being a Physio, I think it may have put unnecessary stress through both shoulder joints when sea swimming. All of the kit I tested in training and was happy throughout the event and for any new event this is what you should do! The trail sections of the run were hard and after the 3rd swim I felt zapped of energy and needed a banana and some shot blocks to give me some pep. I'd also underestimated how hard it was to swim out of the bays against the current and navigate through rocks so the extra energy was needed to get to that finish line. My team mate and I came in 5th female team to cross the line after 2H41 of hard work. We beat the boys! Who came in 6 mins behind us. The course was well marshalled and had lots of safety teams out on the water in kayaks or paddle boards. The friendly and laid-back atmosphere surrounding the race is perfect for me so I'd recommend it to anyone looking for a different type of adventure or just to go somewhere new. Definitely don't underestimate North Wales and the scenery was amazing and was a real pleasure racing through this wild landscape.